I had in my The Dil Maange More Sequel! post mentioned that I would be coming up with something interesting in my next post. Due to some pressing issues that had to be dealt with in subsequent posts, this one got a bit delayed, but I assure you it's worth the wait :). While I was writing on the sequel, I was reminded of a game a couple of our lovely friends had treated us to, a few years ago. Back in those days, when we were Londoners. A had actually gone all out and had come up with this 'dhaasu' (if you let me use the word :)) quiz. And his wife M had done her bit, by helping (or as some of you may call it, cheating ;-)) me with one or two answers here and there. It was girls versus the boys. The yelling and the screaming, the excitement and the arguments, oh my god! I can't stop smiling even as I write about it. It was a nail biting game right till the very end, with the girls team losing by one point, ufff.. So that glorious day inspired me to create a very little fun quiz of my own. And here it is. For all of you friends. 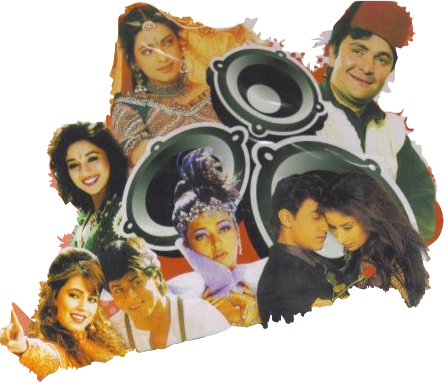 Based on the Bollywood movie masala of 80s and 90s! 2. The real life name of the hero in the movie Tarzan is _________. 3. Amitabh Bacchan played a triple role in the movie _______. The 3 heroines in the movie were ________, _________ and ________. 4. The real life name of the villain in the movie Ghulam is ___________. 5. The music of the film Chandni was composed by _________. 6. The real life name of the vamp in the movie Khoon Bhari Mang is _______. 7. Nana Patekar was highly applauded for his negative role in this movie directed by Vidhu Vinod Chopra. The name of his character was _______ and the name of the movie was _________. 8. Aamir Khan's debut movie as a kid was ___________. And as an adult was ______. b. Uska toh na bad luck hi kharaab hai! c. Duniya mein do type ke keede hote hain..
d. Is thappad ki goonj suni tumne? 10. I give you the theme. You tell me the movie. a. An old couple rent out a room to a budding actress. Their only son has just died and the father is having a tough time to procure the ashes. b. A man is being set in a trap by police officers, who have changed identities, with the intention of arresting him for the murder of his uncle. He falls in love with the officer and and to escape arrest, pretends to be a lunatic. Later finds out who framed him. c. Battle of two lawyers. The junior one has witnessed the collapse of his parents at the hands of the senior lawyer as a kid, and has after a difficult childhood, become a successful lawyer today. d. College life. Romance. Friendship. Politics. Student leader elections. Violence and drama. e. The protagonist is against the dowry system and marries in that fashion. He gets his sister married too without dowry, which creates problems in her married life. PS. Do let me know how you fared. Did you have to scratch your brains real hard or was it a 'do you call this a quiz? hit me with some real stuff!' moment for you? The result is irrelevant dear. @Neena - Why not have a superhero movie theme bday party for Malhar. I loved the idea of a weekend quiz which is all about movies. Believe it or not, consciously or unconsciously these movies do influence us in a way. Be it the story, the actors, the songs or even the few notable dialogues like "Oye Sambha, Kitne aadmi the". Surely this is now on my list of things to do with all my friends. Or Leena Di, how about family reunion discussing movies. Jab kisi pe padta hai na to woh Uthta nahi...Uth jaata hai"
Try try and try, and at last you shall succeed buddy! I could solve on 50 percent, though I considered myself big movie buff. Thanks it was fun. But I'm sure this sounds like great fun to play when you have some company and going girls Vs the guys sounds even better. MAHAAN ! Waheeda Rehman, Parveen Babi and Zeenat Aman !